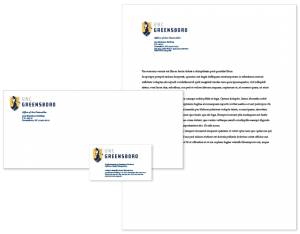 The purpose of the UNC Greensboro Brand Guide is to support your marketing and communications goals while strengthening the University’s brand. Through consistent execution of both internal and external communications across the University, our individual voices become one unified message and, together, we elevate awareness of the University brand. Throughout the Brand Guide you will find the resources needed to assist you with your marketing and communications goals while aligning such with the UNCG brand. Please explore the suite of resources and contact us for guidance. For these reasons, we proudly say: UNC Greensboro creates remarkable real-world impact, every day. 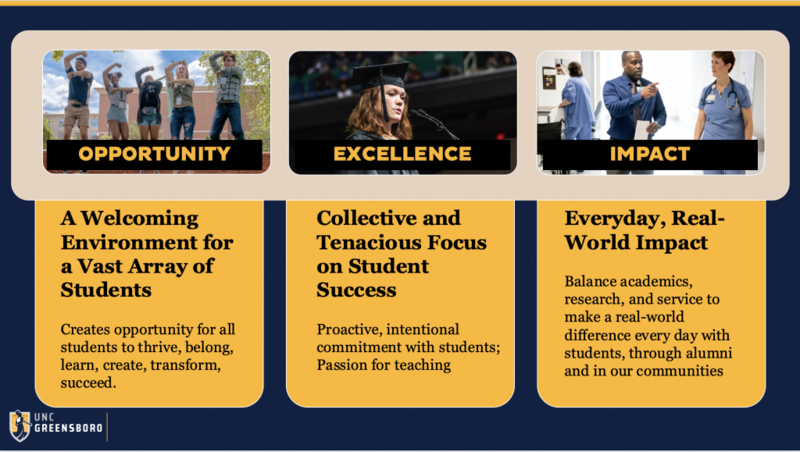 This is the UNCG Brand Statement, the basic foundation of our story. While the words specifically used here don’t necessarily need to show up in all of our marketing and advertising copy, our goal is to ensure that there are clear connections back to these fundamental principles as well as our core messaging (opportunity/welcoming environment; excellence/tenacious commitment to student success; every day impact/research, academics and service). UNC Greensboro creates remarkable real-world impact, every day. You see it every day. In the hard work, inventive ideas and powerful collaborations that define our communities. In schools, hospitals and businesses. The everyday and extraordinary achievements that add up to the remarkable impact of UNC Greensboro. You see it in our students – those who have excelled their entire lives and those bursting with potential that needs to be cultivated. Students from right next door and around the globe share a beautiful and growing campus seamlessly woven into our community and deeply connected to our city. UNC Greensboro is home to a rich array of students who find one thing in common – a welcoming campus, and a place to belong, thrive and achieve their best, each in their own way. Here they immerse themselves in a transformative experience that combines rigorous learning with tenacious, intentional support. They develop their abilities, deepen their understanding and hone their work ethic. You see it in faculty who – in the classroom, the lab, and the community – create and share the knowledge that makes our region and our world healthier, more vibrant and more prosperous. Faculty with the vision to do great research, and the commitment to be great teachers. You see it in the engagement of our faculty, staff and students with our hometown– in the center of our state – where we are an engine of prosperity, innovation, creativity and service. It is true today as it has been for 125 years: UNC Greensboro is relentlessly focused on helping each student unleash their potential and make a meaningful impact with their lives, in our community and around the world, every day. Our comprehensive brand architecture enables areas of the university—large and small—to maintain both brand consistency and the uniqueness of each unit. Connected at our core: While each university unit and the communities they engage and serve differ, we are all connected at our core. UNCG brand architecture consists of two levels: core brand and associated entity. Unit classification and any exceptions are determined by UNCG’s University Communications Division. Core Brand: The core brand is our foundation. Comprised of the brand platform and positioning statement, coupled with the consistent execution of our visual assets, the core brand defines us and our market position. Visual assets for the core brand include the university logo, colors, typography, photography and videography style, tagline and web design. Examples of core brand units include: Office of the Chancellor, Office of the Provost, Academic Units and Student Affairs. Exceptions to the core brand can be made for specific purposes, including but not limited to named schools. Associated entity: Connected to the university, associated entities are nimble. Examples of associated entities include but are not limited to: UNC Greensboro Alumni Association, Weatherspoon Art Museum at UNC Greensboro and Gateway Research Park. UNCG associated entities may use the university logo as a means of showing the connection to the university, but adherence to the core brand assets are not required. Learn more about UNC System Required Elements of University-Associated Entity Relationship as outlined in The UNC Policy Manual. Stationery serves as a valuable tool to communicate the university’s brand clearly, consistently and authoritatively. Across the university, letterhead, envelopes and business cards are uniform. The layout of such stationery may not be redesigned, nor shall additional logos be added. Stationery may be ordered through Spartan Printing. The university logos give proprietary identification to UNC Greensboro, and may only be used by those officially recognized by and associated with the university. If you are interested in becoming a licensed vendor of UNC Greensboro merchandise, please review our Trademark Licensing program, managed by UNCG Athletics. Please visit our section with Web and E-media guidance. For an overview of best practices in Social Media at UNCG visit the social media standards page.